What if your clients included The Royal Children’s Hospital, Australian Centre for the Moving Image (ACMI), VicRoads and the State’s water corporations? Would you trust a group of Bachelor of Commerce students to advise you on financing public infrastructure for the future? The Treasury Corporation of Victoria (TCV) did just that when they engaged 5 Bachelor of Commerce students to assist them in developing an innovative solution for public infrastructure financing and implementation. The TCV assists the Victorian State Government with infrastructure financing through issuing AAA rated securities and offering clients, such as ACMI and VicRoads, an alternative investment tool in exchange for funds that facilitate state infrastructure developments such as AAMI Park Stadium and Wonthaggi’s Desalination project. Since the global financial crisis, TCV identified that financing public infrastructure through traditional debt raising was increasingly unsustainable. 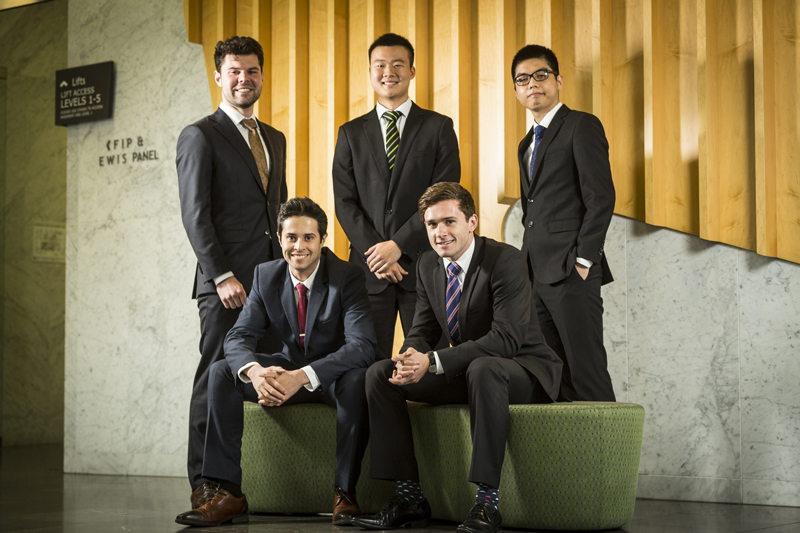 Third-year BCom students in the Management Consulting subject, Liam, Kai Loon, Matthew, Jason and Nicolas, were set the challenging task of addressing this issue in just ten weeks, while completing their studies. Tasked with identifying innovative and feasible methods for financing public infrastructure and determining the most suitable implementation method for Victoria, the team were initially daunted by the project.Getting to the crux of the issue difficult, and they were concerned about being unable to meet TCV's expectations conclusively. The students decided to begin the project by starting with large-scale data collection before defining exactly what they wanted to do with the data. Management Consulting subject Coordinator, Austin Chia (a former Management Consultant himself) calls this method ‘boiling the ocean’. On Austin's advice, the team reviewed a number of management consulting reports, and realised their role was to find the ‘best’ approach rather the ‘right’ approach. They came to understand that their value as consultants was in providing evidence why certain recommendations were the best fit for the client, even if these recommendations may have had perceived flaws. Adopting this fresh approach, the team developed and applied a model to evaluate five financial vehicles based on the hypothetical delivery of five recent infrastructure projects. These projects came from a variety of sectors from education to transport and each one had different qualities that helped to demonstrate the viability of each vehicle. Vehicle effectiveness was measured through their impact on six social and financial parameters: project cost, risk exposure, equitability, efficiency, political viability, and the effect on the Government’s balance sheet. The output of the model, a series of tables ranking the effectiveness of each vehicle in different circumstances, identified trends and differences in the suitability of each vehicle and the best options for TCV. What were your recommendations to the TCV? Jason: We developed guidelines on which financing vehicle matched each project based on the effect on social and financial parameters. Our guidelines focussed on the wider effects on the state of Victoria, rather than the basic effects on the infrastructure project alone. For example, our model demonstrated that one vehicle was particularly effective for large scale projects, however, it was also likely to be highly politically contentious. It was this extra detail that provided the greatest value to TCV. What was it like presenting to your client, TCV? Nicolas: It was the first time I’ve ever had to present a real business plan to an Executive Management team, so it was quite a nerve-racking experience. In the end, the Executives were pleased with what we had to offer and gave us valuable feedback and advice. We felt immensely satisfied, knowing the hours we spent researching, debating and preparing for our presentation were well worth our efforts. Why did you choose the Management Consulting subject? Matthew: Management Consulting offered me the opportunity to gain industry experience whilst at university. The job market for commerce graduates is extremely competitive and gaining some hands on experience, provided me with great skills to take into the workplace. Kai Loon: It provided a departure from a purely academic focus into a professional focused module. This offered an opportunity to test the theories taught at the university as well as hone our judgment on the appropriate usage of the models we’d learnt. Has completing the subject helped shape your career direction? Liam: Completing management consulting helped me confirm what I want from my career. The solidarity that developed within our group over the semester was great, so team-based project work is something I’d like to continue. Management consulting showed me the importance of different experiences within a team. I am a marketing and management major without a strong finance background so I had to use my strengths to assist the group in other areas. The team got to know a few people in here at TCV – all those who they worked with were impressed by their professionalism, their strategic and intellectual approach, and their engagement in the process. Their presentation to the TCV executive management team didn’t just tell us something we already knew,it was a ‘new set of eyes’ on the potential strategies government can consider. The team’s presentation was really informative and it ‘demystified’ the topic. It was an excellent outcome. Management Consulting is a capstone subject in the Bachelor of Commerce which allows students to gain client-facing experience while offering client organisations a fresh perspective on issues their business is facing.